I started hiking in my teens in Arizona and New Mexico, primarily focusing on winter hiking. Since 1991 I have hiked a lot with my brother-in-law Ray mostly in California's Sierra Nevada range, and the southern mountains. In winter I bring as much gear as necessary to be safe and comfortable. For 3-season hiking I try to follow the principles of ultra light. The Xanadu is a rectangular shaped dome tent made for 4-season use. 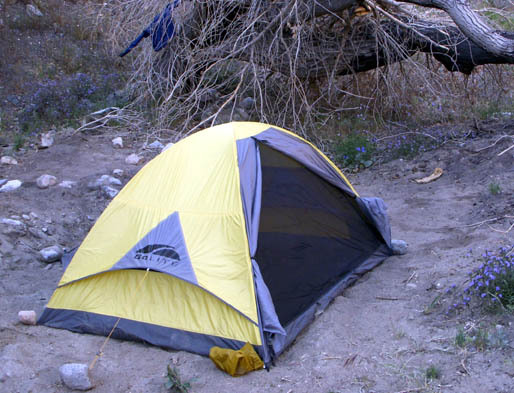 It is a single wall tent, meaning it has no separate rain fly. The body itself is supposed to be waterproof. I have two other single wall tents. 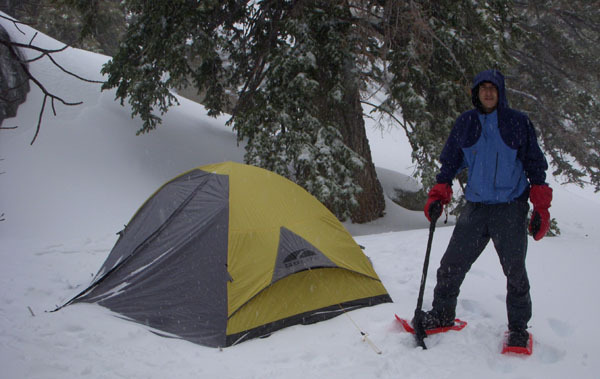 One is a 4-season tent made of breathable fabric, the other is a 3-season tarptent made of silnylon. The Xanadu came with a 5 page hang tag with information about GoLite as a company and the warranty info. There was a tag of all of the tents in the Paradise Shelter collection, another about the Xanadu shelters and one just about this Xanadu 2+. Inside the stuff sack was a single sided piece of paper with set up instructions. According to GoLite the tent is made of what they call SilLite and Epic fabrics. SilLite is their name for silnylon which is silicone impregnated nylon. This fabric is very lightweight but does not breathe. Epic is a brand name of a silicone encapsulated polyester fabric from Nextec Applications Inc. that is supposed to be waterproof/breathable. The sides of the tent that have the doors in it are made from the SilLite fabric and the other two sides are made from the Epic fabric. The bathtub floor is made of 3000mm polyurethane coated nylon. 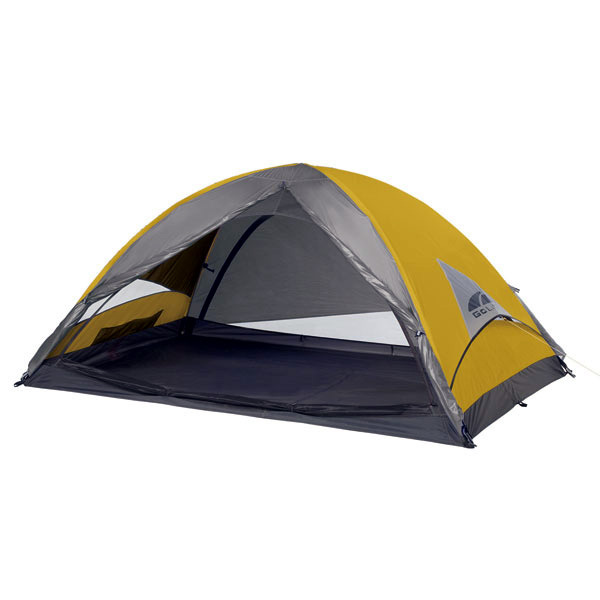 The tent comes with two DAC Featherlite poles that are sectioned and shock corded. The poles can be stored in a SilLite storage sack and make a package 17"/43 cm x 2"/5 cm in size if carried separate. 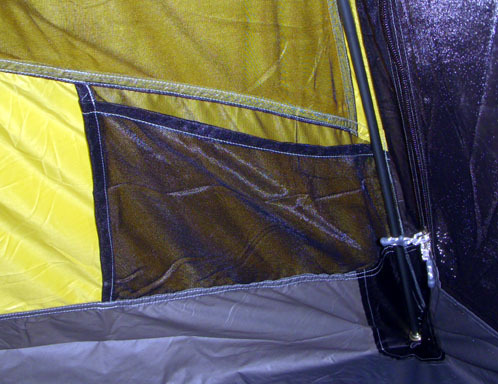 The poles go inside of the tent with pegs at the ends sliding into a reinforced grommet at each corner diagonally. Once bent to form crisscrossing hoops the poles are fastened with hook and loop closures along the seams of the body. Here is a picture of the poles crossing at the top center inside of a fastener. The seams are sewn with hydrophilic thread that is supposed to expand when it gets wet. GoLite says that it "generally" does not need to be seam sealed so I will try it without doing so. The vestibules each have a single zipper with a double direction pull that runs down the center of it. It can be unzipped at the top to help vent the tent. Two loops at the bottom of the vestibule allow it be stretched out from the tent. 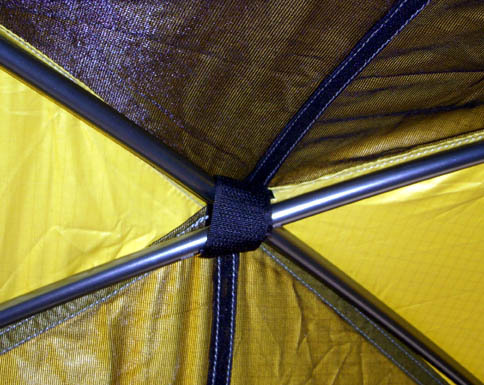 One or both can be undone to get into the tent and both halves can be rolled up and fastened out of the way with a plastic toggle and elastic fabric loop at the side. The large doors have a double ended zipper that travels around one side at the bottom to the other. It does not unzip at the bottom of the tent. Inside the tent are four mesh storage pockets, one at each corner. They are big enough to hold a pair of gloves and hat, or plenty of small items like lights and such. Here is a picture of the pockets and one of the poles sitting in its grommet. It came with 8 aluminum "Y" stakes in a little SilLite sack. 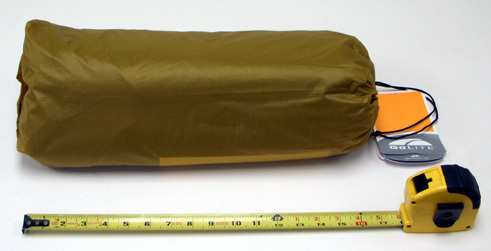 The whole thing packs into another SilLite stuff sack that measures 6"/15 cm x 7"/18 cm x 18"/46 cm. A picture of it stuffed is below. I am taking this tent out for three snowy days this weekend. This concludes my initial report. I used the Xanadu in San Jacinto State Park for a three day trip that had a lot of snow. The temperature got down to 22 F /-6 C and had winds to 50 mph/81 km/h. It was set up at an elevation of 8900'/2713 m sitting on 5'/1.5 m of packed snow. A couple of weeks later I took one of my daughters back up to San Jacinto State Park on a two day trip. This trip was warmer and got up to 50 F/10 C and we stayed at Tamarack Valley at 9100'/2774 m and the snow base was down to about 3'/1 m.
The same daughter and I also went on a camping/hiking trip to Joshua Tree National Park for two days with Ray and Jennifer. The temperature got down to 51 F/11 C with highs around 72 F/22 C. We were camped at an elevation of 4200'/1280 m on sand. I hate to say it, but the Xanadu is not meeting my expectations of a four season winter storm worthy tent. We went on a trip to Mount San Jacinto that had a storm moving in as we were hiking. We found as protected of a spot as possible to make what would be our base camp for the weekend. The picture above was taken right as the storm is getting there. Setting up the Xanadu was pretty easy. I have another tent that uses the poles inside set-up so this was no problem. But the hook and loop tabs that secure the poles are difficult to do with fleece gloves on. The hook portion wants to grab my gloves. I ended up taking off my gloves to attach the tabs, and a couple days later to take them back off. I used snow stakes to anchor it after leveling a pad on the packed snow base. The stakes worked very well to hold the Xanadu even though it got very windy. I did go back out and add two guy lines to the windward side. We were told that the winds topped the 60 mph/97 km/h mark so figure that we saw at least 50 mph /81 km/h. It did not ever pull free during the night. The space inside the tent was wonderful for me on this solo trip. I was able to bring all of my gear inside with me. The only thing that I left in the vestibule was my boots. The problem was the mesh netting. Having two full sides of mesh is great for ventilation and keeping condensation away. I saw no condensation at all. But that is because the wind was blasting under the vestibule walls and through the tent. Spindrift snow would gather on the mesh and then when a really big gust would hit the snow would be pushed through the mesh and would settle on me and my stuff. The vents at the head and foot of the tent would do the same thing. All night long I would get my face pelted with snow that was forced trough the mesh. I had to keep my sleeping bag hood tightly closed up just to keep from getting wet from snow melting on my head. I had snow everywhere inside. I put my shell and pants over my other gear to try to keep the snow out. My sleeping bag was coated except where it would fall off around my arms from movement. Fortunately all of my winter bags are waterproof. Here is a picture that I took between my pad and the door when I woke up around 11:00 PM. As can be seen I could have a snow ball fight inside my tent if I wanted. What was funny was that in the morning my boots which were in the vestibule had barely any snow inside of them while my pack that was inside next to me was full of it. I swept the snow up and threw it out the first morning. The second day I just chopped the stakes free and picked the whole tent up and poured it out. To be quite honest I did not even want to use the Xanadu again and only did so to fulfill my testing obligations to GoLite and backpackgeartest.org. So two weekends later Julia and I went to Tamarack Valley with it. I made sure to bring a cover for her bag as it was not waterproof. The weekend was a very nice one with no wind. 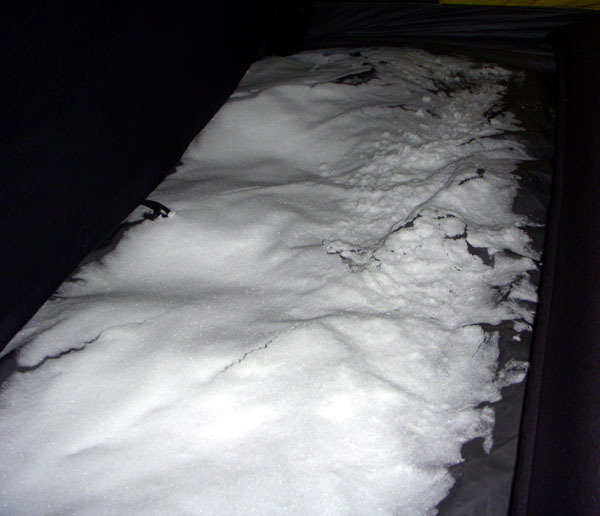 We did not have any problems with snow in the tent. We also did not have any condensation problems really. A little bit just where our heads were and on the bags. That might have even been nothing but my daughter did not want the vent pulled open by our heads. I kept one pack outside and one in a vestibule. The other side we used for entering the tent. While there was enough room for us the two winter bags took up most of the space. The trip to Joshua Tree was a very good outing for the Xanadu. Since camping is only allowed in permanent sites we were able to keep our gear in the truck, so there was plenty of room inside for both of us. I was worried that sand or dirt would blow though the netting the way the snow did, but it was not a problem. I used the stakes to hold it down in the packed dirt camp site. I was worried about not having a footprint for the tent. The floor is pretty light to be taking a lot of abuse from being in rocky dirt. I will watch this during the next two months of use. I have now used the Xanadu tent for a total of 6 nights including the following trips during the past two months. I used the Xanadu on a 30 mile/48 km hike in the San Bernardino Wilderness where I camped at an elevation of 4300'/1311 m on sand next to Mission Creek. The temperature was 75 F/24 C when we stopped and got down to only 60 F/16 C by my thermometer. I hate to say it but I really do not like this tent. I have three of GoLite's packs and like them. Their tent has not impressed me. I did not take the Xanadu on any more winter trips but figured that using it on the first trip above would let me take advantage of all the mesh it uses to keep condensation away while camped next to a running creek. I set it up with stakes where I could get them in the ground. There was a lot of rock just under the surface and where I could not get a stake in I just used a rock to hold the corner or guy line in place. I closed one vestibule side and rolled the other side up and toggled it in place. Here I noticed a new thing that bugs me. When the vestibule is toggled against the tent body the door track is above the opening of the vestibule. Trying to unzip the door to open it makes me have to slide my hand under the vestibule material. This should have been placed so that the zipper has an unblocked run around its opening. And while I do not mind the door dropping down when I am on snow I do not like it falling in the dirt as it did here. I would much rather see a full circle opening for the zipper or at least a big C that would allow the door to hang from above, not be forced to sit on the floor of the tent or outside in the dirt. It was very pleasant to lie in the Xanadu with the big side of mesh keeping it from being too stuffy. My brother in law was melting in his tent as there were a lot of bugs at our site and he did not have all the mesh that I did. I went to sleep with the sound of the creek and the site of the stars outside my mesh wall. About 11:00 pm I woke up to trouble with the mesh and wind again. This time it was sand and dirt blowing through the tent at the mesh wall and the vents. I had to close the vestibule completely letting it drape down on the wall instead of pulling it away as is normal. I did this to keep the wind from blowing under it. I still had dirt everywhere. My eyes felt like they were full of mud in the morning. It did great with one thing though. It did not have one bit of condensation even when I had to close it up. I felt all over the Epic panels and the top for any sign of wetness. Ray got some in his tent so I guess the Epic works pretty good. The web site said that the silnylon picks up dirt. Well they are right. I have never seen so much dirt stuck to my tent. It is in my shop right now waiting to come home where I can set it up and hose it off. On the night by Silverwood Lake it performed great with no blowing dirt problems or condensation. I think that GoLite needs to rethink this tent. If they want it to be a winter tent I think they should get rid of the mesh and just use more Epic or breathable nylon in its place. The vestibules should be bigger for winter use also. They can not hold two peoples packs and still use the doors to exit the tent. And the doors should be made in a configuration that keeps them from sitting on the ground. Thank you to GoLite and backpackgeartest.org for letting me test the Xanadu.